Metso has successfully delivered more than 70 Neles® globe valves for Phase II of the Longyu Coal project in Henan for the production of 400,000 tons of acetic acid/year and 200,000 tons of ethylene glycol/year. The valves have been installed and their operation in extreme conditions has been flawless, proving the safety and reliability of the technology. Top-of-the-line severe service valves featuring Metso Omega(TM) multistage trim design can tackle even the toughest applications for anti-cavitation and noise reduction purposes, thus lowering operating costs and minimizing the need for valve spare parts and other accessories. This, in turn, means a lower total cost of ownership. "The cost effectiveness of our products is one of the key reasons the customer chose Metso technology. Our delivery period of less than six months ensured that our client's project could move forward as scheduled. Our client is extremely pleased with this collaboration," says Lyu Liming, Account Manager, Metso. Metso has a strong position in control valves for petrochemical, chemical, oil & gas, and power customers through its well-known Neles rotary control valves, globe valves, and intelligent valve controller offering. Neles standard and severe service globe valves represent an important element in Metso's extensive portfolio of control valves. The technology plays a key role in most critical processes that operate at extreme pressures and temperatures. 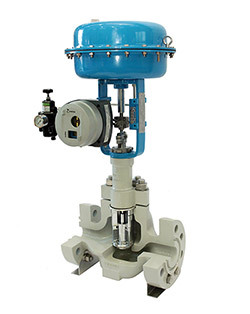 "Neles globe valves offer an innovative and fundamentally simple construction with excellent operational and maintenance features to optimize process performance at the lowest cost," says Markus Hauhia, Metso's Director, Globe Valve product line, Automation. "When paired with our internationally acclaimed Neles ND9000 intelligent valve controllers, these devices provide a very smooth response for exceptional process stability as well as remote diagnostics for highly cost-effective predictive maintenance." "Neles globe valves are used in wide variety of applications. Metso also offers a specially designed steam conditioning valve. Each of our offerings is available in a variety of seat, seal, trim, and actuation options to make them ideal for a wide range of process conditions." Metso has a long track record of delivering engineered performance and reliability to the oil & gas industry with leading brands Neles®, Jamesbury® and Mapag®. In more than 90 years, Metso has delivered globally millions of valves, control valves and on-off valves, and has become one of the leading suppliers of intelligent valve controllers. Metso's valve technology and services offering helps maximize production efficiency and reduce safety risks throughout the life cycle of a plant, all the way from simplifying valve selection to improving process availability and maximizing production performance. All of this is backed by field service expertise from currently over 55 Metso Automation service hubs and over 30 valve service centers around the world. Automation's valve technology and supply centers are located in Finland, the US, Germany, China, South Korea, India and Brazil. Phase II of the Longyu Coal project in Henan includes two projects with a production capacity of 400,000 tons of acetic acid/year and 200,000 tons of ethylene glycol/year. Key installations include an acetic acid plant, ethylene glycol production equipment, a coal gasification plant, an air separation unit, a gas synthesis and purification set-up, sulfur recovery unit, public works and auxiliary production facilities. The project covers an area of about 400,000 ha. with a project value estimated at around USD 72 million. The project is an initiative from Yongcheng County in Shangqiu in Henan Province to become a leading strategic player in China's coal chemical industry.